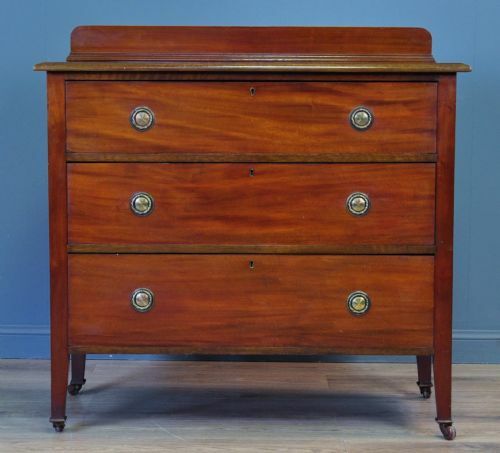 Attractive small vintage mahogany chest of four drawers with brush slide. 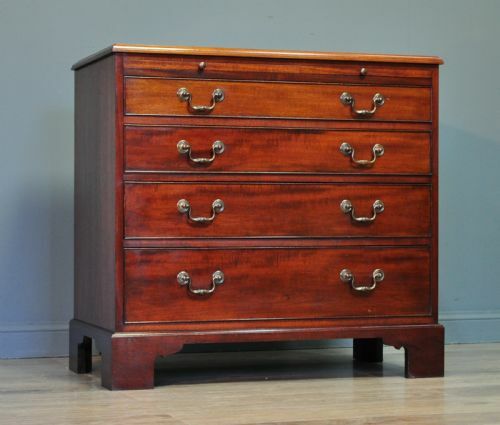 A lovely small mahogany chest. We date this chest to the mid 20th century. The chest of drawers sits on four shapely bracket feet. The chest consists of a chest of four graduated drawers below a brush slide. The drawers are fitted with decorative cast swan neck handles mounted on circular back plates. The brush slide has small brass button handles. The chest of drawers has a height of 30.5" (77cm), a width of 32.5" (83cm) and a depth of 18" (46cm). 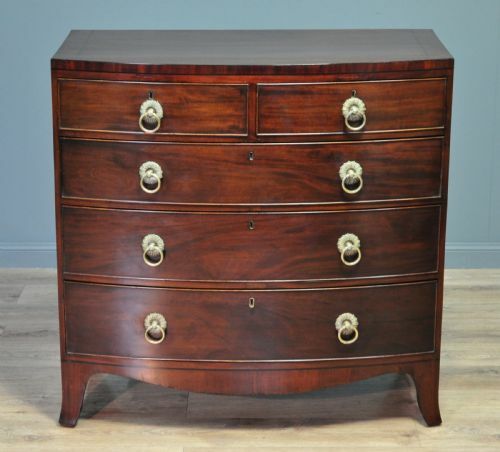 This lovely vintage mahogany chest of drawers remains in a good solid condition with only minor surface markings commensurate with age and usage, including some indentations, minor marks and wear to the finish, primarily to some of the edges. 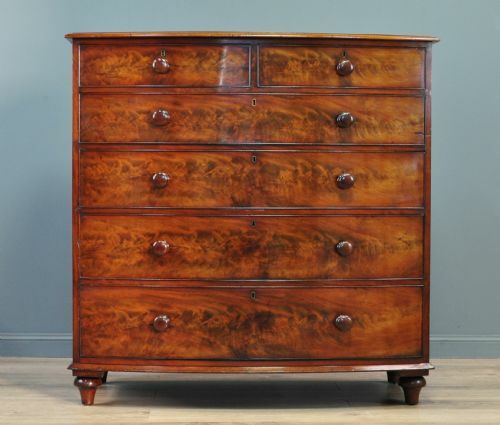 This remains a very stylish and elegant mahogany chest of drawers which will continue to provide good service for many years to come. Attractive antique Edwardian oak chest of five drawers. A lovely antique oak chest of drawers. We date this chest of drawers to the early 20th century. The drawers are fitted with decorative cast drop handles mounted on shapely back plates. The bottom handles have been replaced with period ones at some point in the past. The drawers are fitted with locks (no key is supplied but a suitable replacement should be easily obtainable). The chest has an overall height of 40" (102cm), an overall width of 42" (107cm) and an overall depth of 18" (46cm). 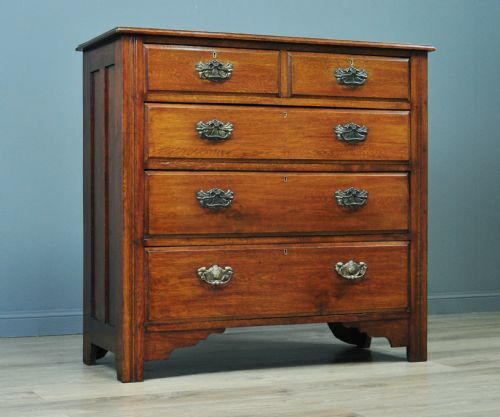 This attractive oak chest of drawers remains in very good solid condition with only very minor surface markings commensurate with age and usage. There is some minor wear from past use, this is primarily to the top surface. 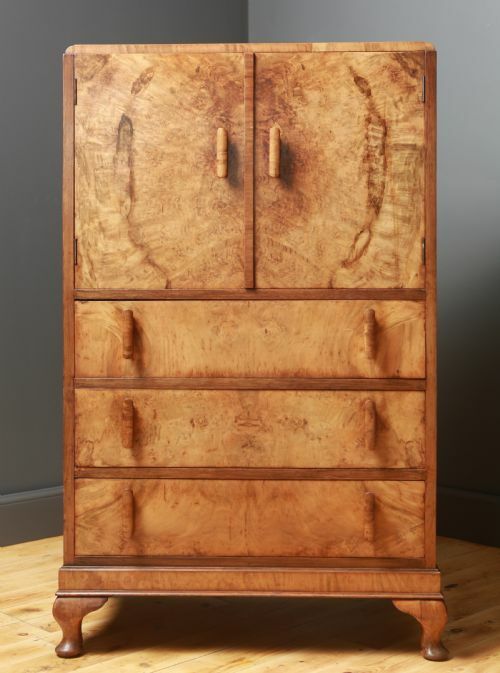 A lovely walnut tallboy chest. We date this tallboy to the first half of the 20th century. The tallboy sits on small queen anne legs at the front and rear. The front of the top section of the tallboy is of two panel design, with each panel being a side hinged door. The doors have been been veneered with well matched finely figured walnut. The doors are fitted with shapely art deco bar handles. There is a small gallery to the rear of the cabinet. There is a bank of three drawers under the cupboard section. These are fitted with pairs of handles matching the cupboard handles. The tallboy has an overall height of 51" (130cm), a main table height of 49.5" (126cm), a width of 32" (82cm) and a depth of 19.5" (49cm). This lovely walnut tallboy remains in very good solid condition with only very minor surface markings commensurate with age and usage, including a few minor marks and scratches to the finish, this is primarily to the top surface. The finish has mellowed a little over time and there is a small piece of wooden moulding missing to the bottom of the outer left hand side. The right hand door would have originally had a ball catch but this is missing, the door stays firmly shut without it. Attractive antique Edwardian mahogany chest of three drawers. A lovely Edwardian mahogany chest of drawers. We date this chest of drawers to the early 20th century. The chest of drawers sits on small square section legs above their original ceramic castors. The chest consists of three wide drawers and has a small decorative gallery to the rear. The drawers are all fitted with brass drop loop handles on shapely embossed brass backplates. The drawers are fitted with locks (no key is supplied but a suitable replacement should be easily obtainable if required). The chest has an overall height of 37.5" (95cm), a main top surface height of 34" (86cm), a width of 38.5" (98cm) and a depth of 19.5" (50cm). 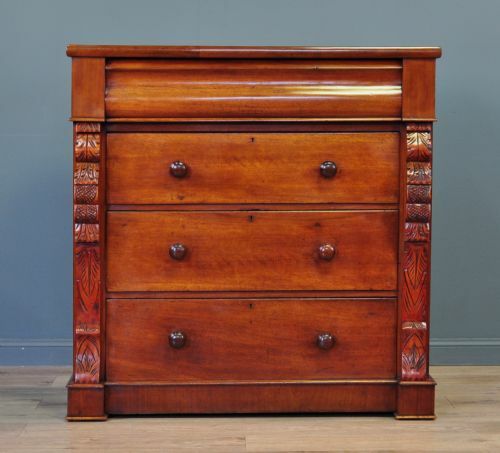 This attractive Edwardian mahogany chest of drawers remains in very good solid condition with only very minor surface markings commensurate with age and usage, including some minor indented marks to the top surface and around some edges. The backboards have been replaced with pine at some point in the past. This remains a very stylish & elegant Edwardian mahogany chest of drawers providing useful storage space. It will continue to provide sterling service for many years to come. A lovely vintage chest of drawers. We date this chest of drawers to the 1920's. The drawers are fitted with decorative cast brass drop handles mounted on circular embossed back plates. The top drawers are fitted with locks (no key is supplied, but a suitable replacement should be easily obtainable if required). The chest has a height of 36" (92cm), a width of 38" (97cm) and a depth of 19" (49cm). This attractive pine chest of drawers remains in good solid condition with only very minor surface markings commensurate with age and usage, including some minor indentations and wear to the finish. There are also a few minor burn marks to the outer edges of the top surface. This remains a very stylish & elegant pine chest of drawers providing useful storage space. It will continue to provide good service for many years to come. 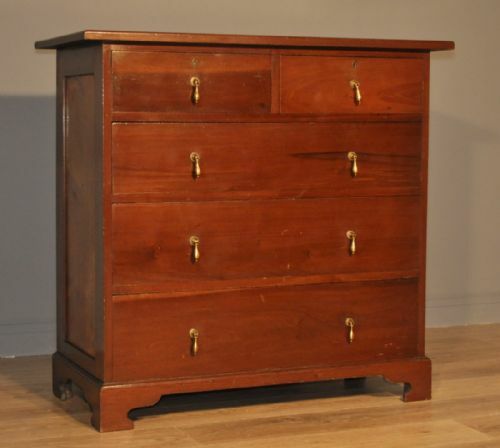 Attractive antique light oak chest of three graduated drawers. 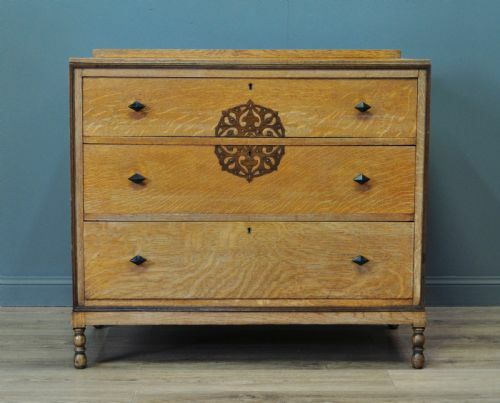 A lovely antique light oak chest of drawers. We date this chest of drawers to the early 20th century. The chest of drawers sits on small turned legs. The chest consists of three graduated drawers. 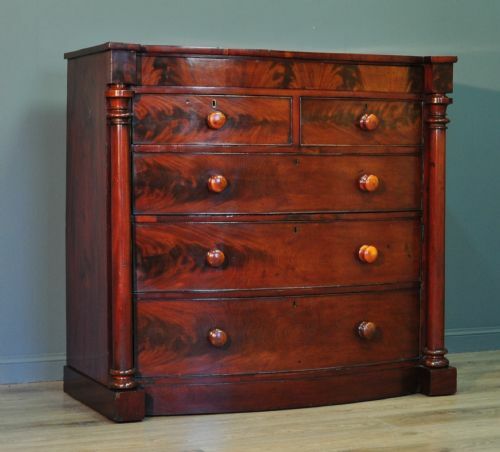 The drawers are fitted with rhombus shaped handles and there is an attractive pierced crest to the centre of the chest. The chest table has a small gallery to the rear. The chest has an overall height of 33" (84cm) with a chest height of 32" (82cm), an overall width of 36.5" (93cm) and an overall depth of 19.5" (50cm). 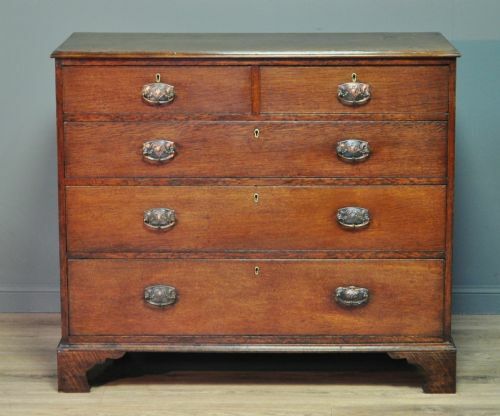 This attractive oak chest of drawers remains in very good solid condition with only very minor surface markings commensurate with age and usage. There is some minor wear to the finish to the top surface from past use.